(Edit in 2017)- This buffet is now under a new name and management. I have visited the new restaurant once in which I was treated for as a guest but the food was still good. You may recall I previously gave my "best buffet in Seoul" recognition (albeit begrudgingly) to The Parkview at the Shilla Hotel. The place I'm introducing today, however, is the place I'm putting down my stamp of approval for "best overall value" among Seoul's higher end buffets. Vizavi, run by the Walker Hill brand, is located in the currently renovating COEX block and is easily overlooked- I myself didn't even know this buffet existed here until my visit on this occasion. The prices are still pretty hefty here (as it is in most Korean buffets) but still substantially cheaper than other buffets of similar class including, of course, the Parkview. It's not difficult to find other buffets in Seoul to beat Vizavi's prices, especially any of the chain buffets scattered about the city, but the draw at Vizavi is that the food, for the most part, is actually good and fairly diverse. I've dined at a few other buffets in Korea in the past few years but for Vizavi's food quality and price, I've found it's the place to beat, which is why I'm giving it the title of best value buffet among the high end buffets of Seoul. On my visit, a live jazz band greeted patrons by playing near the entrance which added a nice elegant touch for anytime you're entertaining guests or on a night out with a special someone. Vizavi is quite spacious and the various food stations all spread out over a mostly easy to navigate floor. Corners include a fully stocked DYI salad bar and a spread of pre-made salads, seafood station with fresh sushi/sashimi, grill station, noodle station, Korean food corner, made-to-order pasta station, dim sum, Chinese food, baked desserts, fruit and even a gelato station. Here's a look at the food items and plates I had on my visit. I dived straight for the seafood corner first. Various cuts of tuna is freshly sliced and presented by sushi chefs as are other sashimi cuts and sushi. Smoked salmon, crab legs, cooked salmon and other standard seafood fares are also available. The seafood was fresh and definitely superb quality. Then again, this is of course a necessary standard for any buffet in Asia so it wasn't a big surprise a buffet of Vizavi's caliber had a fine seafood section. A fish tank nearby holds the live little swimmers patrons will eventually feed on and they're prepared in front of you so you know it's nice and fresh. I've heard Vizavi now offers boiled shrimp and fresh shucked oysters which is probably a seasonal thing now that it's full-on winter but it also reflects the buffet's focus on seasonal and fresh ingredients and food. The soy sauce marinated shrimps, which is actually found in the Korean food section, were a nice surprise I haven't seen before in other buffets here. A delicacy in many Korean seafood restaurants, the good ones get it right by making it not too savory but not too fishy and Vizavi nails it down. But other items I sampled from the seafood corner included tako wasabi (chopped octopus with wasabi), tataki (seared tuna), and more. Steamed crab legs were in ample supply and were stocked frequently. The salad corner is fresh and, in addition to common salad choices like caprese and caesar, an eclectic spread was offered for all tastes. These included smoked duck salad, bamboo shoot salad, beans and couscous salad Greek salad and more. The build your own salad corner is also stocked with a variety of greens, dressings and toppings like nuts. A bit more variety in other vegetables would have been nice but then again I rarely make and eat my own salads at buffets so not a biggie for me. The bread and cheese corner is stocked well with a variety of tapenade, pesto and chutney spreads and a small but decent spread of cheeses. There's jamon too which isn'tthat unique to the Seoul dining scene but always a pleasant surprise to encounter. The barbecue station is rather impressive at first sight, offering freshly grilled lamb chops, galbi, shrimp, grilled crab leg meat, spicy chicken, steak and such fresh from the grill. Being a steak lover, I was rather disappointed in the steak and galbi which were a bit tough and more fat than meat. The lamb chops, grilled asparagus were good while the grilled crab leg meat was a bit rubbery. The build your own noodle station allows one to pick up ingredients to have the chef construct your choice of jjambbong, ramen, jjangmyeon and pho after five or so minutes. Wanting something a little light and simple to wash down the greasy meat platter I had before, I chose to get a pho with extremely low expectations and thinking I'd most likely end up eating a bit of the noodles and leaving the rest up. However on first taste I was really blown away. The broth was very deep and close to the authentic phos I've had back in the joints in the States and miles better than any of the plethora of pho -chains in Seoul. The broth really tasted like it had been boiled for hours and with authentic spices though still lacking the cilantro that so many Koreans disdain. I didn't sample the other noodle dishes but based on my experience with their pho alone, I'd love to try the other choices the next time I visit. The other hot bar menu items are mostly Italian and American-inspired with pizzas, baked tomatoes, etc. Assorted tempuras are also offered. They were standard with no standout items but nothing that was terrible, stale or cold either. The made-to-order pasta bar includes typical Korean favorite choices such as vongole, carbonara, etc. You can watch your chef make your pasta in front of you and my vongole was quite delicious with lots of seafood and plenty of garlic. The dim sum and Chinese food section is extensive with different dumplings and hot Chinese dishes but were all just average and nothing to rave about. Still, if choices is your thing, you'll find the selection here more than plenty. The Korean food section offers favorites such as jabchae, yookhwae and more and were good but no one really comes to a buffet in Korea for the Korean food now do they? Desserts lovers will love Vizavi for offering quite the selection of after-meal choices which I don't think I've seen many buffets in Korea, even the Parkview, parallel yet. The fruits and cheese section is extensive and includes some exotic items such as passionfruit. The fruits are fresh and good quality and the array of cheeses have plenty of cuts of bread and crackers to go with. A wide range of cakes and other baked goods were offered catering to different palates from fruit fillings to chocolate and more. They weren't as good as the Shilla but still high quality and, again, a wider range of choices offered. There's also a make-your-own patbingsu (shaved ice) section and a big gelato ice cream section but the gelato counter is strangely hidden away in the back of the buffet, closer to the bathrooms, making it easy to miss. I didn't sample the gelato but there was at least 8 or so different selections offered. Vizavi isn't quite at the level of the Parkview but it's still a gem on its own, with mostly high quality ingredients and a keen eye on freshness. The seafood, salad, pasta, noodles and desserts corner are the definite high points of Vizavi while its grill and dim sum sections are average but plenty of offerings. The buffet is spacious, the chefs and attendants generally attentive and friendly and the food (for a Korean buffet) is generally good. 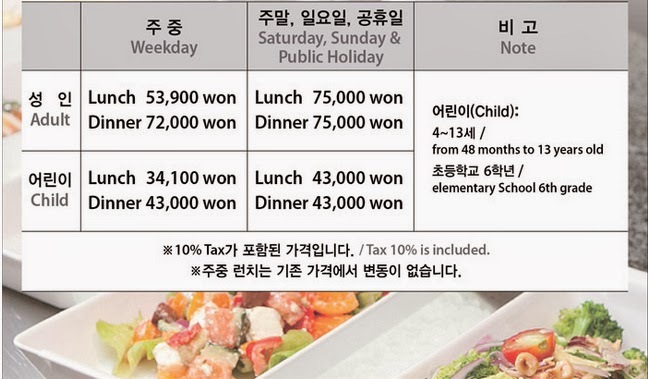 In comparison, a dinner at the Vizavi, even on a weekend, is a whopping 25,000 won cheaper than The Parkview. In addition, various promotions are constantly being offered including recently a 30% discount deal for women who dine during weekday lunch and a 50% discount for those using SKT Chocolate and more. So if you're planning on heading here, check around to see if any promotions are being made for a bigger cut. I've seen it listed on social commerce sites before too. I should mention that COEX is undergoing major renovations, leaving most of the mall's shops and stores (except for things like its movie theater, aquarium, etc) to be closed until at least December of 2014. So if you're far and aways from COEX you may want to consider whether it's worth trekking out to here. But all that aside, despite a few misses, Vizavi overall is an excellent place to dine for anyone looking to go to a high quality buffet in Korea. Its overall standings and price easily gives it the title of Seoul's best value buffet among the top tier buffets I've been in Seoul so far and to give you the most for your hard earned won. It's not the Parkview at the Shilla but when comparing quality, taste, choices, and price, Vizavi is, so far, the best buffet for your money I've encountered in Seoul. Parking: First 3 hours (from time of entry into the parking garage) at COEX is free. But it can get pricey after that! Alcohol: Extensive wine menu and other specialty alcohols such as Hwayo offered. Tip: As COEX is undergoing renovation, Vizavi seems to be trying hard to attract customers with a constant range of deals and promotions (including showing up on social commerce sites at times). Be on the lookout for any deals if you choose to go! Heading over to catch a flick at the CGV before or after is a nice and popular date course and, if you brought a car, you can always extend your free parking with the CGV parking stamp you get with your movie ticket.